This pilgrimage church, built in honour of St John of Nepomuk, stands at Zelená Hora, not far from dár nad Sázavou in Moravia. Constructed at the beginning of the 18th century on a star-shaped plan, it is the most unusual work by the great architect Jan Blazej Santini, whose highly original style falls between neo-Gothic and Baroque. 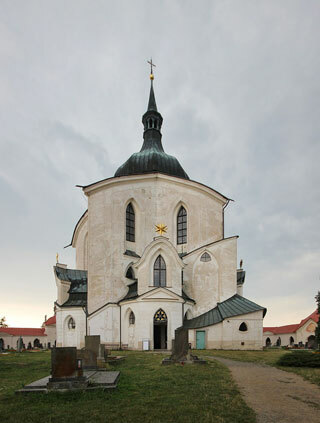 This article uses material from UNESCO World Heritage List article "Pilgrimage Church of St John of Nepomuk", which is released under the Creative Commons Attribution-Share-Alike 3.0 IGO License.